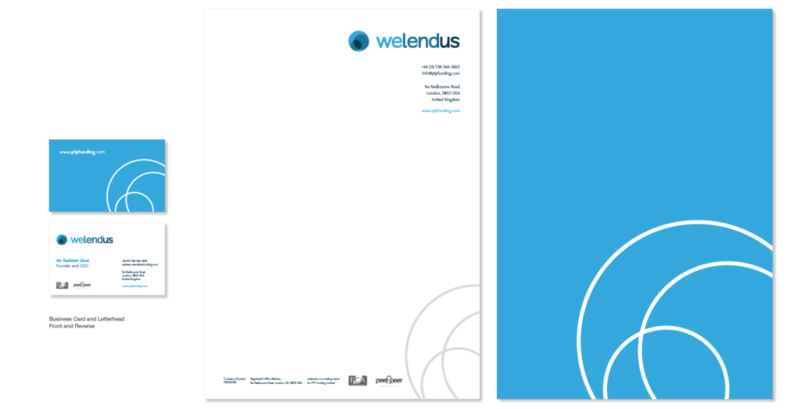 Peer to peer loan provider Welendus came to us recently to support them with a range of branding consultancy work. This start-up branding project included providing counsel over name shortlisting qualitative ranking and ultimate name selection, corporate identity development and the creation of a range of digital and offline brand assets. The resulting name ‘Welendus’ was selected as it not only provided a unique new word, but also adds the ‘does what it says on the tin’ factor which expresses how peer to peer lending works and leverages the company’s mission and core values of providing a transparent, ethical and inclusive approach to near-prime to sub-prime loan products. In addition to the key consumer credit facing side to the brand, Welendus is also in the process of attracting and securing private investors to the business who are looking to improve on the interest rates and returns available through the main high street banks’ investment products. When branding start-ups and launching them into busy consumer or B2B sectors such as the consumer credit marketplace it is essential that a strong point of difference and cut-through is created for the brand. If the point of difference is based on the core proposition as in ‘we lend us’ i.e. how peer to peer funding actually works, then the brand is consistent both inside and out. In this case the point of difference runs through Welendus like DNA or Blackpool rock resulting in a single-minded thought that will enable the next steps in the journey to complete brand articulation to follow a clear path.